Eastern Redbud or other flowering tree? I am on the landscaping committee for a condo in downtown Toronto, and the Board is looking into planting 2 – 3 ornamental trees as part of a rejuvenation project. They have considered flowering cherries to start, but I have come across the Eastern Redbud (Cercis Canadensis), which seems like a hardier flowering tree? Given the conditions below – do you agree, or do you think that there are better options from which to choose? Garden Light Conditions: Our building has a large back garden, with a number of tall/mature deciduous as well as large coniferous trees, which throw some shade. The garden bed that I am working with is also located on the southern most portion of the garden, along a back fence (not a solid fence, so it allow light), with a building close by to the south. However, the large trees (described above) are to the west, which would cast afternoon shade more than this southern-neighbour building. I would say that the location gets only partial (not full) sun for these reasons. 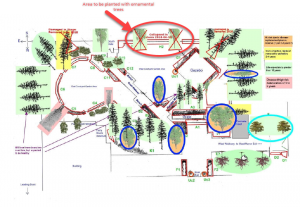 I’ve included a map and the trees would be planted in garden where two previous trees were blown over in a storm. You will see what other things are growing there too, with this map. Soil: Our garden is directly over a subway line, so there is about 3-4 feet of alkaline soil, then there is concrete below that. The soil is more clay-like than sandy. We apply mulch and fertilizer (both flower bed, and tree-stake fertilizer) on a rotating cycle every 2 (fertilizer) to 3 (mulch) years. We have an irrigation system, with sprinklers (not drip-line) along this southern garden bed. Thank you for contacting the Toronto Master Gardeners with your inquiry concerning the planting of Eastern Redbud trees. An excellent non profit resource for advice, sourcing, planting and information on trees grown here in Toronto is LEAF https://www.yourleaf.org/.